Crystal was such a delight to work with. 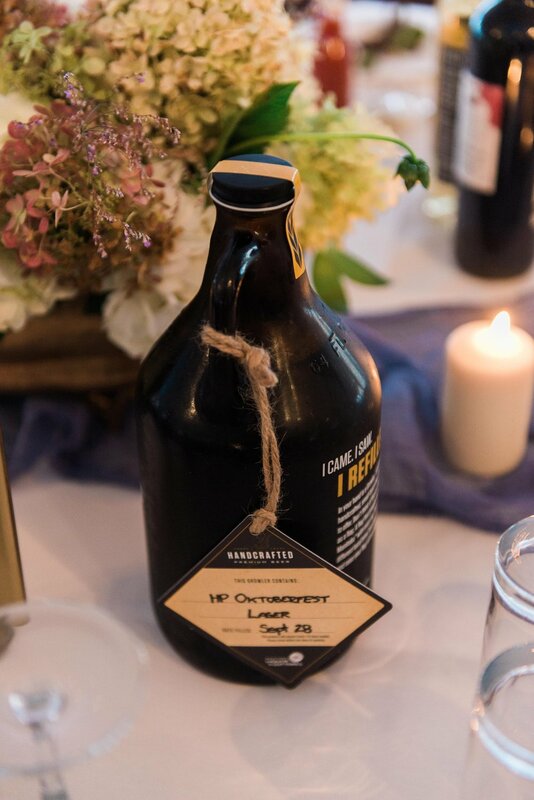 With a distinct vision for her wedding to Jason, I had a lot of fun helping her to plan this organic fall wedding at Pineridge Hollow. 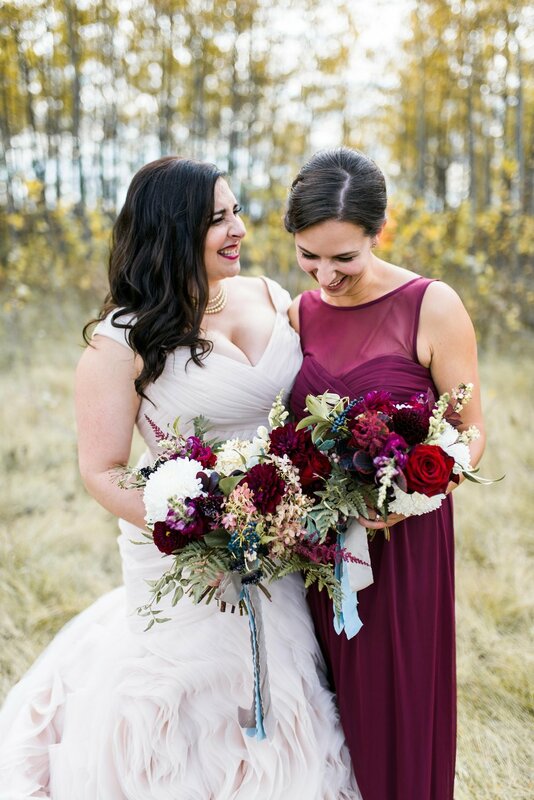 She really loves rich colours, so the burgundy and navy that we wove throughout the florals was perfect. She also had this amazing idea for me to come and basically cut down her entire antique hydrangea plant the week of the wedding. Well, hers didn't last super well so she arranged for me to cut from the plants that a local business were growing. It made me SO happy. I love the delicate hint of colour in Crystal's bridal gown! She was wearing pearls when we first met, so I wasn't surprised that she wore them again on the wedding day. Bridal Bouquet ingredients: antique hydrangea, astilbe, dahlias, roses, mums, scabiosa, snap dragons, snowberries and viburnum berries along with leather leaf fern, jasmine vine, and nagi foliage. I finished with soft blue and mocha silk ribbon. The ceremony was on the back of Pineridge Hollow's property, a small clearing in the woods. I dressed up their birch arbor with this simple, but large, arrangement of fresh and dried hydrangea. At the front of the aisle sat two large wine barrels, one with a greenery garland and candles and the other with this enormous (and heavy!) arrangement of hydrangea, delphinium, smokebush, and tailing greens. 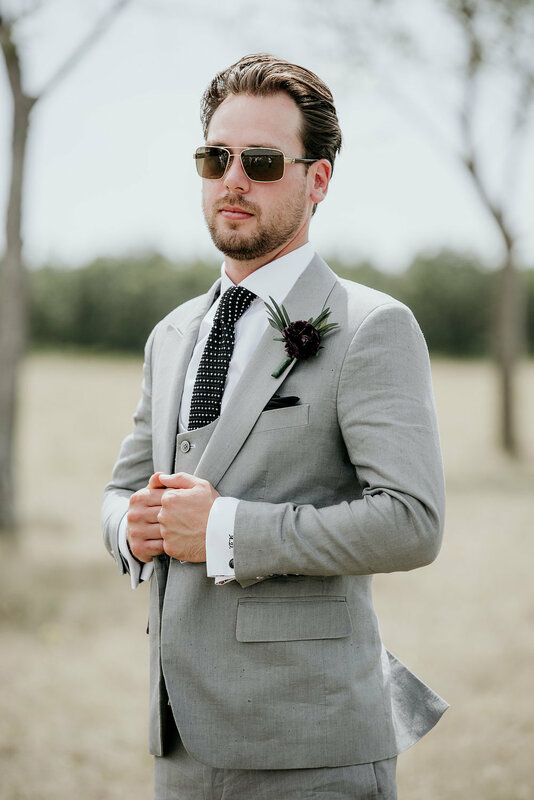 The reception details were some of my favourites! 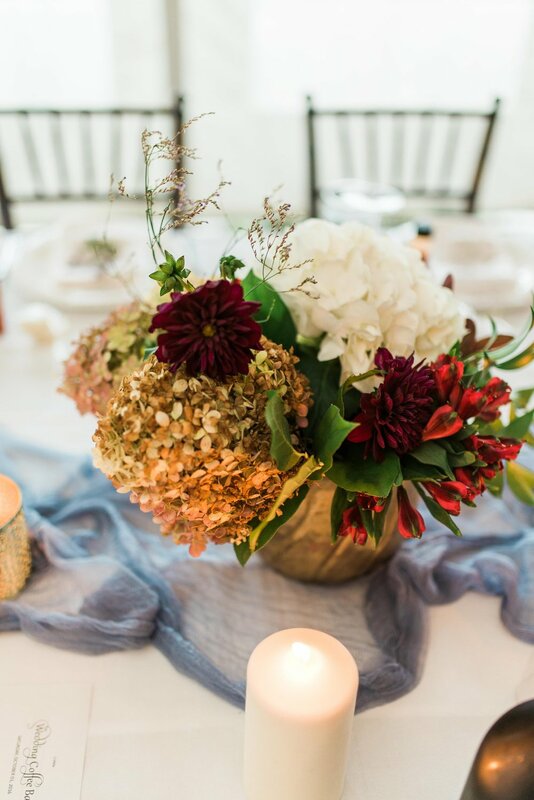 Crystal hand-died these cheesecloth table runners the perfect smoky blue tone, and collected these gorgeous brass pots for me to use as centrepiece containers. These were so cool - she bought them for a song at a furniture store that was closing out. The store was charing a lot for them because they had expensive faux plants in them, but when they found out that she just wanted the pots, they gave her a great deal - which is amazing, considering these things cost a fortune regularly! Above the reception space, we created a greenery installation that was a lot of fun (and terror) to create. The grapevine globe lights from Event Light were a gorgeous addition. Happy Valentine's Day! 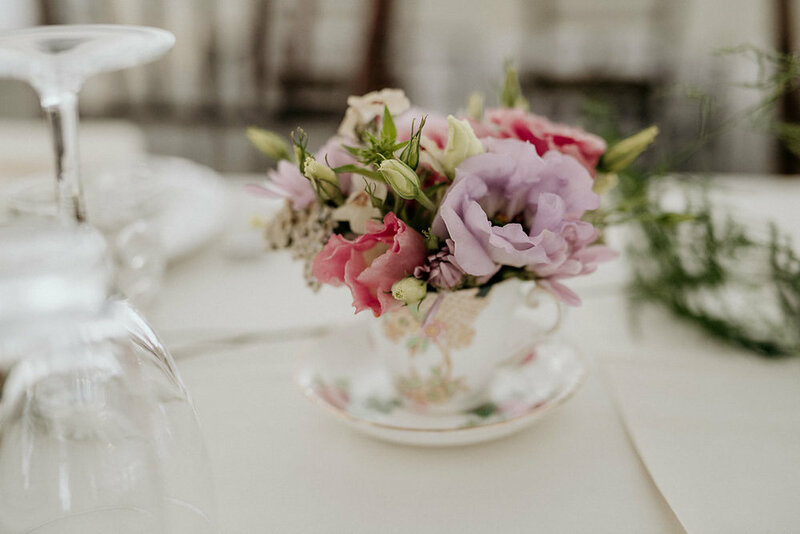 This year, I'm not doing much in the way of flowers for lovers BUT I'm heading off to Seattle in a few days to take a workshop with Sinclair & Moore, one of my absolute floral and event design idols. I can't wait! Designing Loriann's wedding flowers was so peaceful. 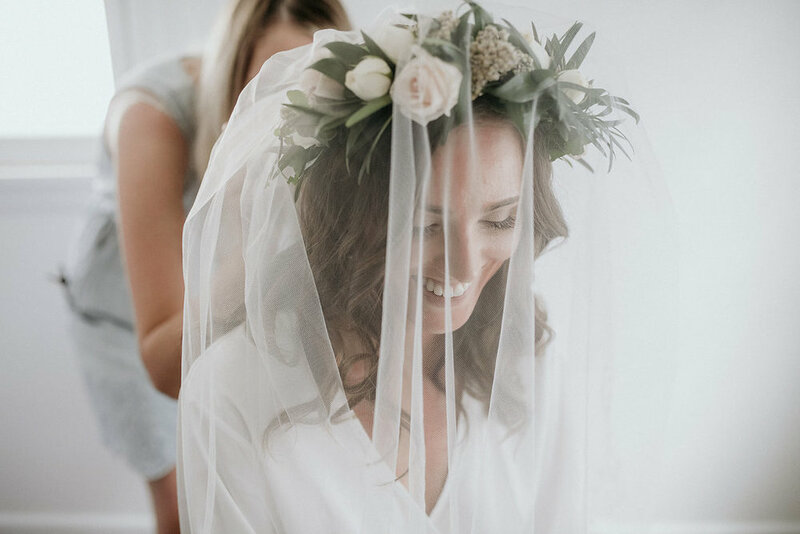 She wanted a whimsical style for her woodsy wedding at Pineridge Hollow, and had such a calm, peaceful palette of soft purples and greens. 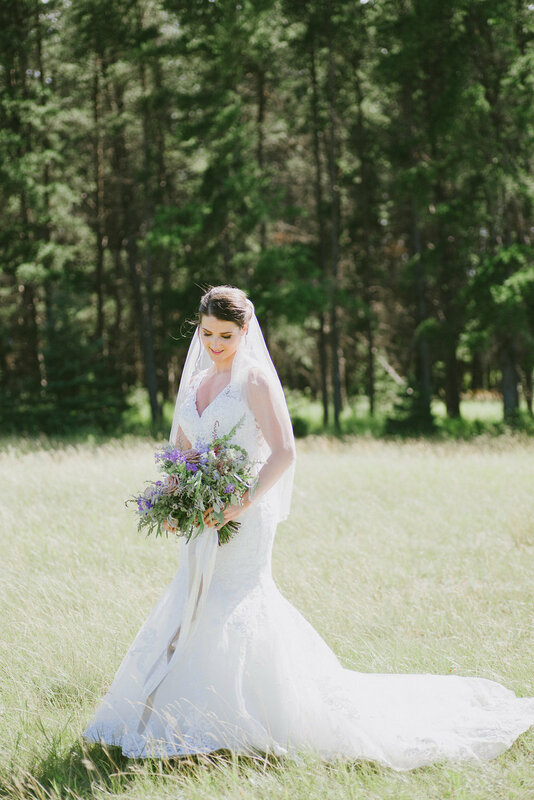 Loriann's bouquet was light and airy to hold, filled with textured greens, and a few touches of pale lavender, mauve, and blush. The colours and textures were so beautiful with the dusty pink bridesmaid dresses! 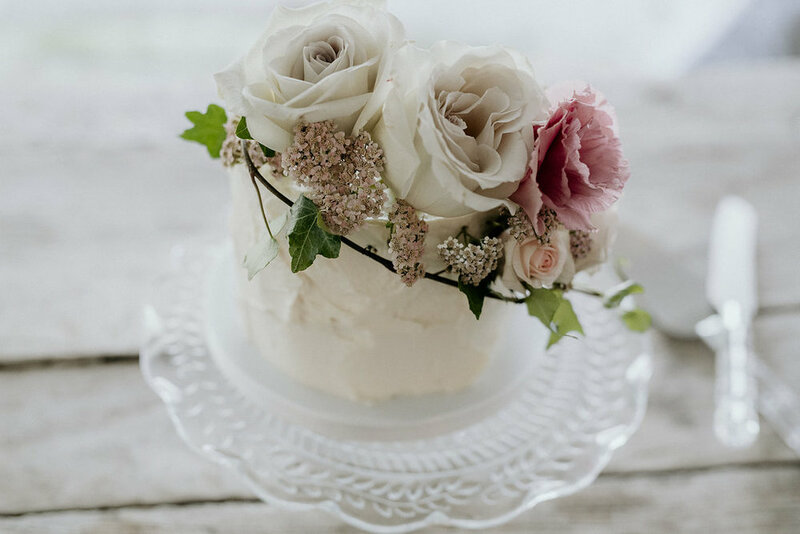 Take a look at these beautiful photos from Sugar & Soul Photography! Amnesia roses, scabiosa, limoneum, snap dragons, astilbe, and eryngium with acacia, feather eucalyptus, and seeded eucalyptus. Can we talk about how cute these little flower girls are? So adorable. I made these sweet and light flower halos of light purple limoneum for each of them! Pineridge Hollow has a beautiful birch arbor for their outdoor garden ceremonies, and I love adding flowers to it. 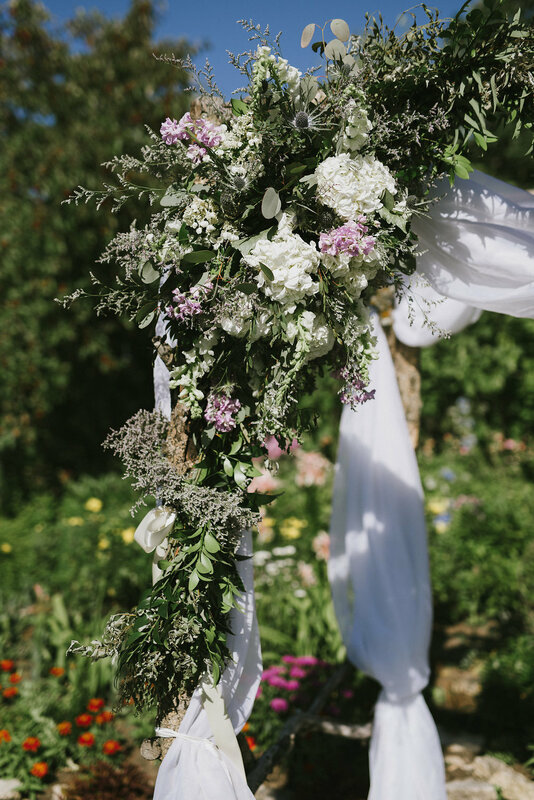 For this wedding, I started with a garland of silver willow and other greenery, tied the ends back with limoneum ties, and added in that large, asymmetrical floral piece using hydrangea, stock, snap dragons and eryngium. 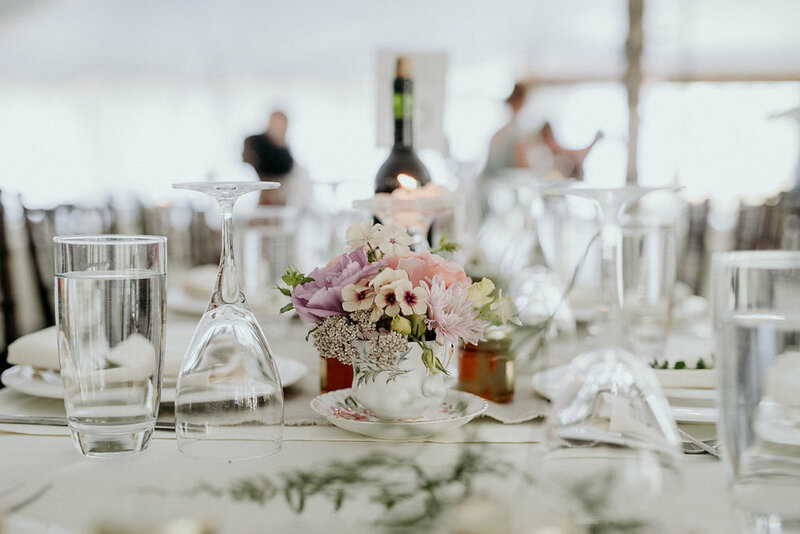 Inside the tent reception, Pineridge Hollow's gorgeous metal lanterns were placed down the tables, and I simply added in touches of greenery to complete the whimsical, woodsy feel.